Hello, For specific shipping related questions, please call our customer service number between the hours of 8-6, Monday through Friday. I've posted the service number below. (201) 567-6666 Thanks! Protecting your documents is certainly important but looking good while doing so is hard to do. Until now of course. If you're looking for sleek and classy, the black color will certainly do the trick. 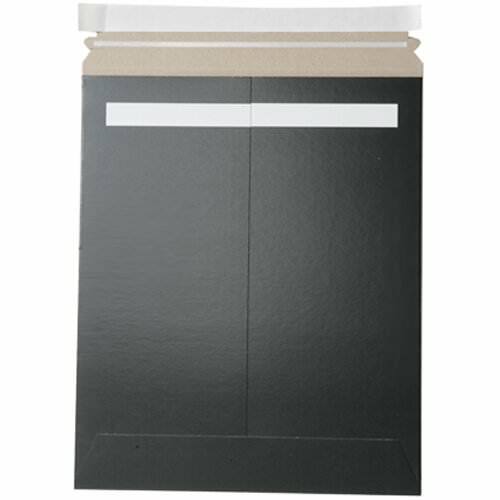 The stiff, sturdy and strong cardstock material will let all of your documents be safe and secure. This envelope is great for photographs you want to keep intact. Those precious moments will never be bent, even on that rough ride cross country. The peel and seal closure will never let your contents fall out. All you have to do is peel, seal and press down - the adhesive really does do all the work! With the gentle, smooth finish, your envelope will appeal to the masses. Whether you're sending an important document to your big boss or sending a photograph to your grandmother down south, these envelopes will be able to get the job done all the while keeping your style together.